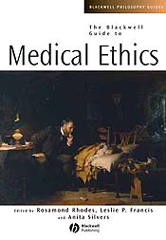 The Blackwell Guide to Medical Ethics is a guide to the complex literature written on the increasingly dense topic of ethics in relation to the new technologies of medicine.Examines the key ethical issues and debates which have resulted from the rapid advances in biomedical technology. Brings together the leading scholars from a wide range of disciplines, including philosophy, medicine, theology and law, to discuss these issues. Tackles such topics as ending life, patient choice, selling body parts, resourcing and confidentiality. Organized with a coherent structure that differentiates between the decisions of individuals and those of social policy.